On my first night back in Africa I slept among fever trees, in a dark valley surrounded by a hazy horizon of light. Half an hour after disembarking the plane, I’d watched two lionesses pad 50 metres down a dust road before slipping silently from the beam of our lights and into long, dry grass. Nightjars – I lost count on our way to camp – had flittered out of the path of the Land Cruiser and once, I caught a glimpse of the wings of an owl. Twenty hours after locking the front door in Pamplona, Spain, I was en route to The Emakoko, a lodge inside Nairobi National Park. Usually night drives are not permitted in the 117-square-kilometre park – unless you’re a guest at Emakoko and your flight gets in after sunset. Arriving in the dark is pretty special and after negotiating the jumble of Nairobi traffic along roads that fray into dust, the peace of the park’s darkness is instant African-bush gratification. That pure smell of dry grass; the anticipation of what you might see in your headlights; silhouettes of acacias against the night sky; eyes reflecting from the darkness. At night the park is surrounded by the glow of city lights and by day, multi-storey buildings loom on the horizon. And that’s what makes this park so special. Less than half an hour from the airport, it boasts an abundance of wildlife: more than 60 black rhinos, 20-odd white rhinos; a large lion population; 580-something species of birds; herds of 100-plus buffaloes. The first morning I woke up back in Africa, on my way to pick Mark up from the airport, I saw red hartebeest, giraffe, impala and warthog. An hour after he landed, we were shooting more giraffe, white rhinos, secretary birds, kudu, and a herd of Maasai cattle. By sunset we’d added lion, Thomson’s gazelle, black rhino, buffaloes, eland, zebra and waterbuck to our list. 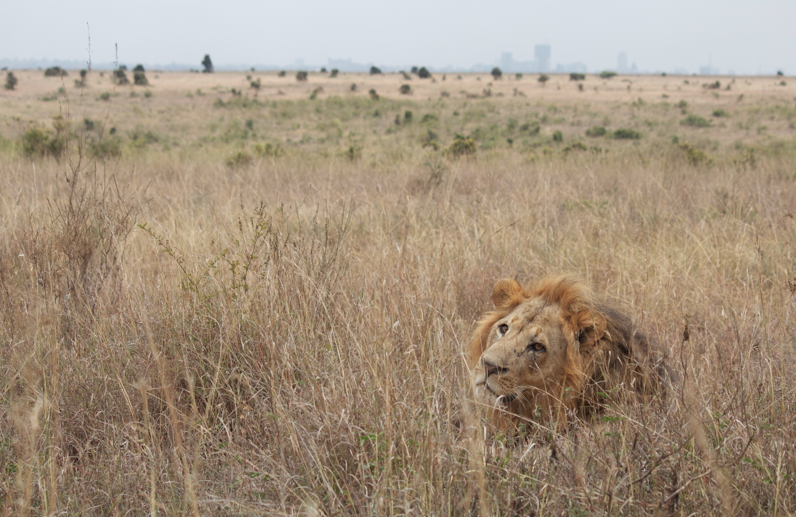 Mark and I have left Nairobi National Park and the beautiful comfort of The Emakoko, and I’m writing now from an overlanding camp in Nairobi. By the time you read this, the city skyline will be far behind us and we’ll be rattling our way south to Amboseli National Park in a 1970-something Land Cruiser. We’ll be on the road for the next two weeks or so, camping and exploring various parks as we circumnavigate Mount Kenya. Mark and I have a lot of work to deliver in the next month, and we’ll be setting up office every evening around our campfire. Although we’re chasing deadlines, our itinerary is fairly loose and we’re travelling happily on African time. It really is good to be back on my home continent.